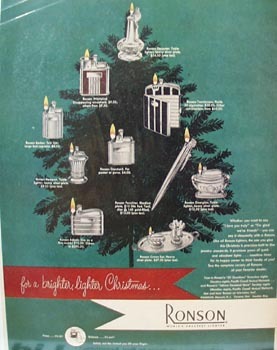 Ronson Christmas Ad 1949 This is a December 12, 1949 advertisement It is a nice color ad from Ronson of Newark NJ. Pictures different models of cigarette lighters, each lit, as decorations on a Christmas tree. It reads, for a brighter, lighter Christmas. In mint condition. Photo is taken through plastic and may show wrinkles or crookedness that is not in the ad. This magazine tear sheet measures 9 1/2"" wide by 12 1/2"" tall. Items Similar To "Ronson Christmas Ad 1949"